One of the main reasons Jurgen Klinsmann was so highly sought after to be the United States men's soccer team coach was that he would be fearless and that he would do everything to make the U.S. a world power. You can see all that on display tonight when the United States plays a friendly ... in Mexico. The USMNT hasn't played a friendly in Mexico in nearly three decades,* and lifetime, they're 0-23-1 on the road with their rivals. Yikes. 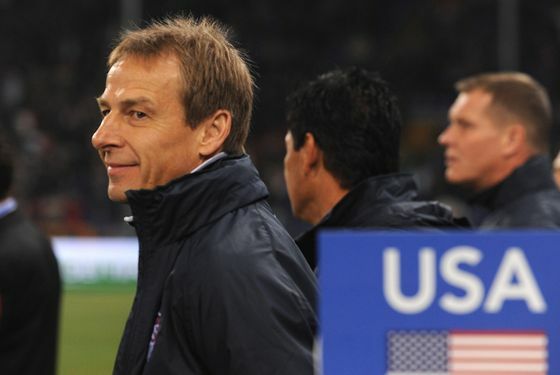 "With the game in Mexico City," Klinsmann says, "it's a great benchmark to have." The U.S. won't have their full squad — Clint Dempsey won't be there, for example — and Mexico is coming off a gold medal in the Olympics. But this is all prep anyway, for ongoing CONCACAF World Cup qualification, which commences again September 7 and September 11 against Jamaica. The game is on ESPN2 at 8 p.m. tonight. Hopefully the U.S. will either win or exit the crazy Estadio Azteca in Mexico City in one piece. Heck, maybe even both. * This post has been corrected. The USMNT last played a friendly in Mexico on October 17, 1984, though they've had other matches there since then.